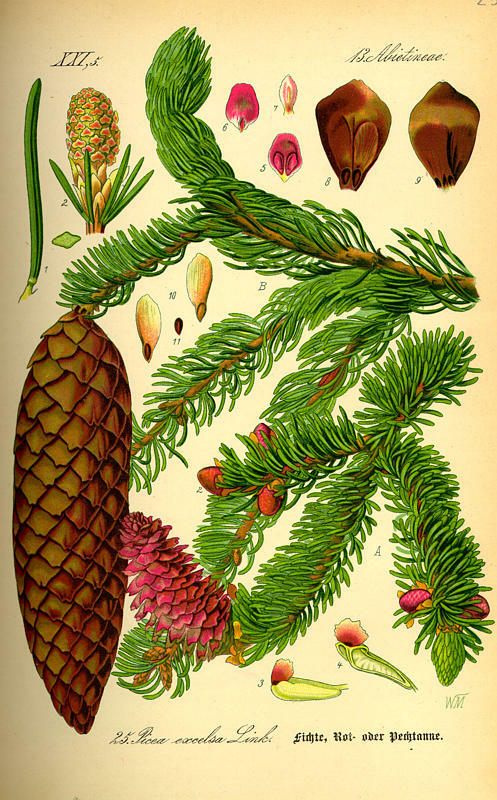 European spruce ranges, and commentary on Picea spp. ...or what to think when someone proclaims they have a top of German (or Italian, or Swiss, or Carpathian, or French, or Jugoslavian) spruce. My personal search for The Truth About Spruce has been ongoing for many years, but took a turn when someone insisted that Picea abies and Picea excelsa were two names for the same species. I had always understood they were separate, as the woods associated with the two names were certainly (I thought) quite different. I got busy with the web, some books and spoke at length with a couple of experts. I gained a better idea of what's what now with European spruce, and here's what I found out. First of all, the guy who lumped them together was right and I was out of date. In terms of the lutherie world, or for that matter the world of plant biology, there is but one species of spruce—used for lutherie—in all of Europe: Picea abies. The map below shows the three current European ranges of Picea abies, a tree commonly known as Norway spruce in the US and Canada, epicéa commun in France, épinette de Norvège in Québec, gemeinefichte or rotefichte in German, and jel europeiskaya in Russia. 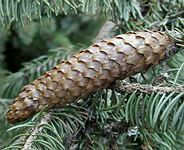 Other common names abound, and the overriding one, in many languages, is the translated local equivalent of red spruce. As with most spruces, these trees naturally and historically live in cooler, higher elevations, preferring lots of moisture and rich, somewhat acidic soils. The original range includes most of Europe outside permafrost from the Scandinavian arctic down to northern Greece, west to the French Massif Central. 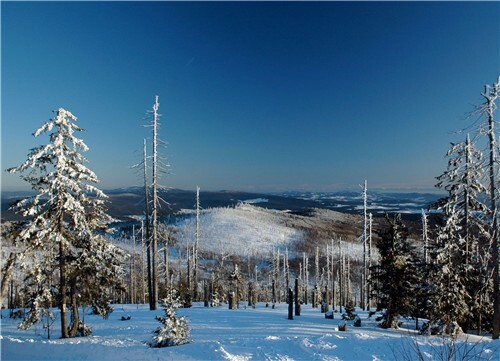 The northern range extends off the map towards the Urals where it meets and hybridizes with Picea obovata. P. abies has been planted all over the planet by now, and adapts to a wide variety of soils and climates probably because it survived the Ice Age. 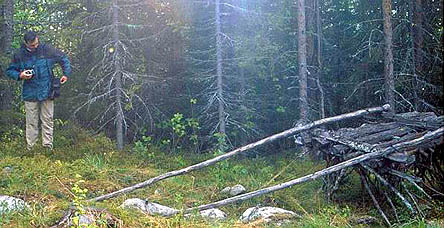 The largest known example of one is in a park just west of Moscow, though this is an anomaly, since these trees typically don't live longer than about 200 years. Tiny remnants of the pre-glacier and pre-human-impact older range are found in the Pyrenees, down the center of Italy, and along the south coast of the Black Sea, in northern Turkey. The most southerly of the three ranges in this map (darkest green) lies in France, Switzerland, Italy and a bit of Austria and Slovenia - in other words, the south face of the Alps - trailing down through the mountainous parts of Bosnia, Herzegovina, Serbia and Montenegro, with remnants in Bulgaria and the Balkans. This is the part of the historical range that escaped glaciation and provided the reservoir for the reintroduction of the species back into the northern ranges after the glaciers retreated. The spruces of the lower range were, until recently, taxonomically classified as Picea excelsa. Many sources still refer to that as a species, while some refer to it as the German botanical designation for Picea abies. In any case, Picea excelsa has now been folded together with Picea abies as a single species. If you see the term Picea excelsa, it'll be in—or referenced to—older literature. The trees in the lower range are also still classified by some botanists as a subspecies called Picea abies v.excelsa. It is debatable if this is a wise designation, as the only thing distinguishing this so-called subspecies is how it grows in that environment. A propos, this is the range from which the Cremonese master violinmakers and the lutherie elite of Europe has historically gotten their wood. The white band separating the two lower ranges in the map above marks the high elevations of the Alps where icebergs try to grow, while the larger blank area east of there is the lowlands of Hungary and so on. The middle light-green range on the north slope of the Alps and across southern Germany and east into Poland and Czechoslovakia contains Picea abies, most of which has been reintroduced since 1800. 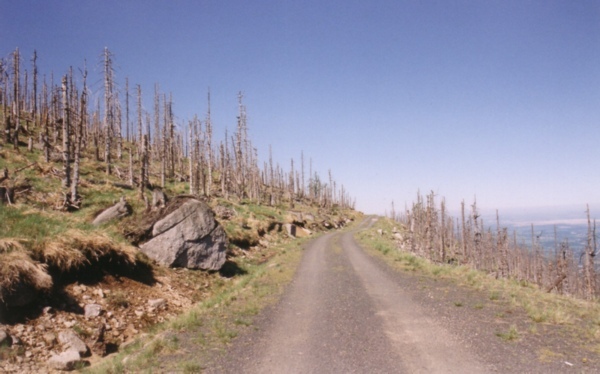 Because of the thorough exploitation and devastation of the forests through the end of the 18th century and the enormous timber demand in early industrial times, the natural forests, which had already regrown after the retreat of the glaciers, were eliminated and eventually reborn as artificial forests. 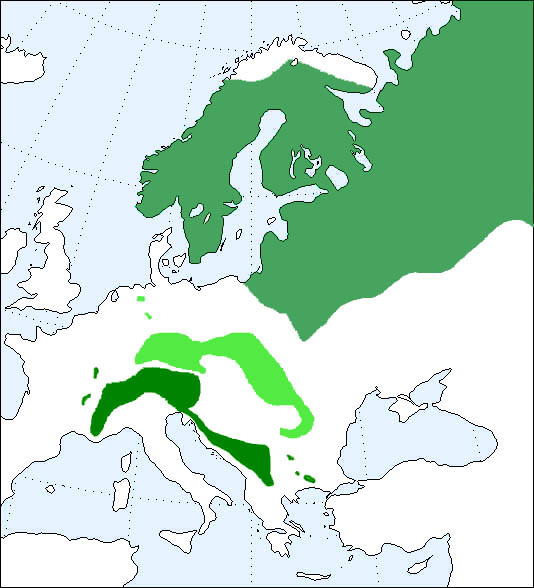 Ironically, the seed stock for the reintroduced Picea abies came from the relatively unscathed Scandinavian range (gray-green) at the top of the map, which had re-established itself from that southern reservoir after the last Ice Age. Today, Picea abies comprises 35% of the tree cover in Germany, and most of that is in managed forests. Among the other major conifers in German forests are Picea glauca, an American import, and Douglas fir, another American import. These trees have been grown successfully in Germany for a very long time (see below). More information about acid rain here. Moreover, if you have ever spent time talking wood with instrument makers in Germany, they will chuckle and tell you they consider "German spruce" not just a misnomer but an unlikelihood. They generally get their spruce from farther south, in Italy, Slovenia, Switzerland or France. This has always been the source of the best lutherie spruce. As Horst Grünert, a bass and cello maker in Penzberg, Bavaria, once cheerfully told me, he'd go right out with his chainsaw and get the rare spruce in Germany if he could find it, but he said that for all intents and purposes, it had been extinct in Germany for several centuries (again, see below). The spruce I was seeing all over the Alps was, he said, good for fence posts and pulp, and that's what it was farmed for. Outside of parks and so on, I never saw trees larger than about eight inches either. That's them in the above three photos. I know of only one wood cutter inside the German border, high in the Alps close to Switzerland, who harvests and mills spruce for lutherie. German spruce - possible, but probably not. Dealers in Germany sell lots of good spruce, but it's seldom if ever from trees harvested on German soil. (I know of but one German woodcutter selling German-grown P. abies for luthiers.) I therefore see the term "German spruce" as a code word for Picea abies, the European spruce. Italian, Swiss, French, Jugoslavian, Swedish, Carpathian, and Italian spruce - yes, especially if it's Picea abies (or Picea excelsa), which it almost certainly is. For an intriguing look at Carpathian spruce, click here to visit the site of John Preston's Old World Tonewood Company. John really knows his stuff and brings in great wood. Be sure and check his photo gallery. 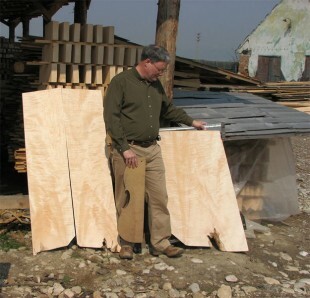 Another outstanding and well-known woodcutter is Bruce Harvie, of Orcas Island Tonewoods. Bruce deals in tonewoods of the western US for the most part. By all means check out his music as well. Makers and consumers engage in and disseminate a great deal of misinformation—trading the same stories from unquestioned sources. Interestingly, the people who actually go out into the wilderness after this stuff on behalf of instrument makers have a background in botany and really know the facts. Sidebar: Intercontinental trade in forest seed was established in the early 1700s, when seed of several eastern American species (yellow locust being a big one) were frequently shipped to Europe, mainly for use in ornamental plantations. Regular forest plantations of Picea glauca (white spruce), Pinus strobus (eastern white pine), and a few other American conifers, however, also began to be cultivated in Europe shortly after 1700. 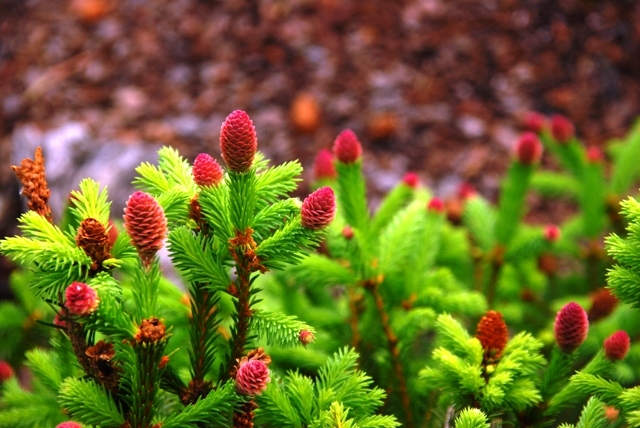 The first seed samples of northwestern American species, including Douglas fir and Sitka spruce, were sent to Europe about 1825 by the famous botanical explorer, David Douglas. Trade on a substantial scale in these species, however, did not begin until after the opening of the Pacific Railroad in 1869. The center of the trade in those days was San Francisco, where seed from the northwest was shipped by boat and thence east by train to dealers on the Atlantic coast, or direct to customers in Europe. Darmstadt in Germany was the other end of the pipeline in this trade. Bearing in mind that Picea glauca was introduced into Europe about 1700 from America and mainly used in shelterbelt plantings, it may be mentioned, merely as a curious fact, that seed of this species has been exported in considerable quantities from Europe (Denmark) to Canada during the last decades. Even seed of such American species as Sitka spruce and western red cedar (both, however, of selected origin) have recently been exported from Denmark to American dealers. This is indeed an improved forest seed version of "carrying coals to Newcastle." Unless you cut the tree yourself or can be absolutely certain where that tree was harvested, it is probably safest to just call it spruce. If you're certain it grew and was harvested in Europe, there's no point in getting your turban in a twist over common names. If someone says German spruce, just think, "OK, Picea abies, or European spruce." I think to discern any differences between, say, Italian and Swedish and French spruce, you need only look to some analogs in the local (North American) spruces, because so many examples lie before us, a record that is huge and fresh. 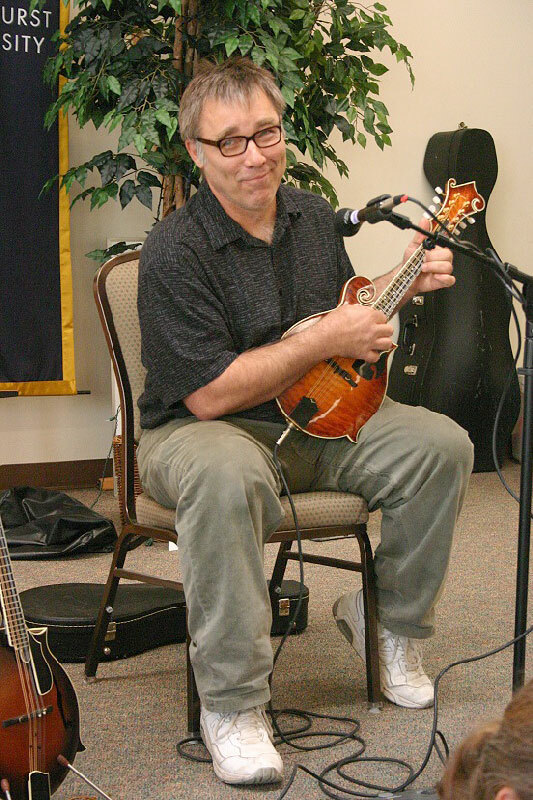 Just consider the staggering output of the big guitarmaking concerns like Martin, Gibson, and Taylor, not to mention folks like SCGC, Bourgeois, Collings and so on. What a consistent and generous resource for the rest of us, just to examine and evaluate their results. For starters, many thousands of guitars by these major makers are made from Sitka that grew in British Columbia, or Oregon, or other places. Can anyone tell them apart? By the same token, is Engelmann from New Mexico reliably discernible from Engelmann from Canada? Can anyone tell them apart after they've been made into guitars? 2) have a trained scientist with a high powered microscope, a library of appropriate reference samples and a lot of skill and experience, give it a serious lab analysis. And realize that there's even some question about the absolute reliability of this method—the best there is—because the reference sample libraries are not always complete and comprehensive. Other than that you are operating on pure faith in the seller, or on pure imagination, because things are quite often not what they seem. Back to my earlier point, and about provenance: Engelmann comes from British Columbia and it also comes from New Mexico. That's as big a geographic spread as Sweden and Italy. Sitka comes from Alaska and from northern California—same thing. Adirondack comes from Georgia and from Québec—same thing. Is there any reliable coherence within species? Don't bet on it. We know them all, we see many examples of their applications, and that experience, we fervently hope, informs us. But not based on a handful of anecdotes. And that's following the notion that location means anything definitive I'm really not sure it does, except in a general sense. 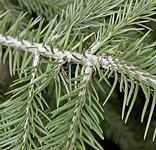 There's good and bad spruce from any location, any species. We all know this. Species and/or location is interesting chatter, but can be a waste of time too. Being able to listen to and hear a promising piece of wood, and knowing how to bring out its potential, is what it is really all about. Drop me a line click here!